Welcome to our CS6 launch site. We have gathered the best talent in the industry to discuss the new Creative Suite 6 in-depth. Enjoy the new feature notes, reviews and tutorials. 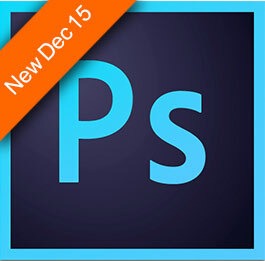 There has been a lot ofmisunderstanding about how to buy your Creative Suite, CS6 products. While Adobe has released the Creative Cloud, the option to buy individual products or Suites remains the same. You can still order a boxed copy from Adobe or resellers, you can still buy a download if you prefer. There is still upgrade pricing available etc. Just like always. So if you are a person who prefers to own, or only have the need for a single product, this might be the best way for you to go. For those who decide on the Creative Cloud, this is what it looks like. There are two main areas that will interest you. One is files. This is where you can keep your images and files on the cloud (Adobe’s servers). You have 20 GB to play with. The part that you will care about the most right now is the Apps tab. 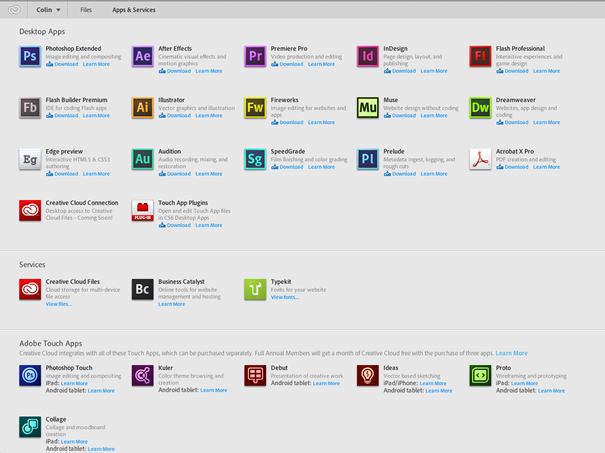 Here is where accessis granted to all the Adobe Apps from the Creative Suite Master collection. They Don’t RUN from the cloud, the license server does. When you run programs (apps), they check with the Creative Cloud to make sure your subscription is active. As long as it’s active, you can run all the programs. As far as I know, the cloud apps will run on 2 machines, just like the Current Adobe apps. The difference is, you can run one on Mac and one on Windows if you prefer. The apps need to be downloaded to your local computer and they install just like they always have. 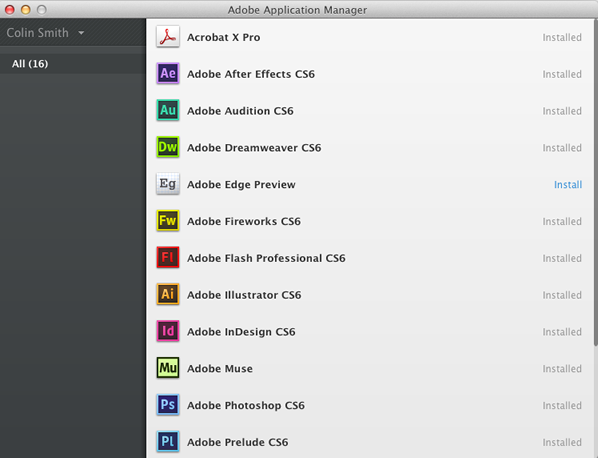 This is how it works, first of all the Adobe Application Manager is downloaded. The app manager runs on your desktop and lists all the available apps. Simply click install to download and install. You can choose several products at a time and they will download and install one at a time. Installation is painless and runs in the background. I selected all the apps and went out for dinner. When I returned, they were all installed. The process was painless for me. Apps are launched from your dock or desktop, just like any other app. You also have access to Business Catalyst, which is a no-program website you can set up for yourself either through Dreamweaver or Muse. You can have up to 5 feature rich sites with a subscription (This used to be called Goodbarry, before an Adobe acquisition). You also have access to typekit, a service which serves up web fonts, for adding something more interesting to your website than arial. All the touch apps are listed on the page too, but they aren’t included, you have to purchase them separately. So, I guess you will be looking for a recommendation from me? Adobe’ pricing on Creative Cloud is $49.99 per month. This includes all the Creative Suite Apps as well as 20 Gb hosting, and storage. Create Suite CS3,4 and 5 users can get the Creative Cloud for $29.99 per month for the first year. It’s not a cut and dry answer. For me, it represents great value because I use almost all the apps in the suite on both Mac and Windows, so it makes a lot of sense. For those who don’t already own the latest version of the Suite, it’s a great way to get into all the Adobe products for essentially $50 a month. That’s $600 a year. If you already own a current suite, look at the upgrade price and them compare it to 18months-2 years between upgrades at $600 a year and see what makes sense to you. 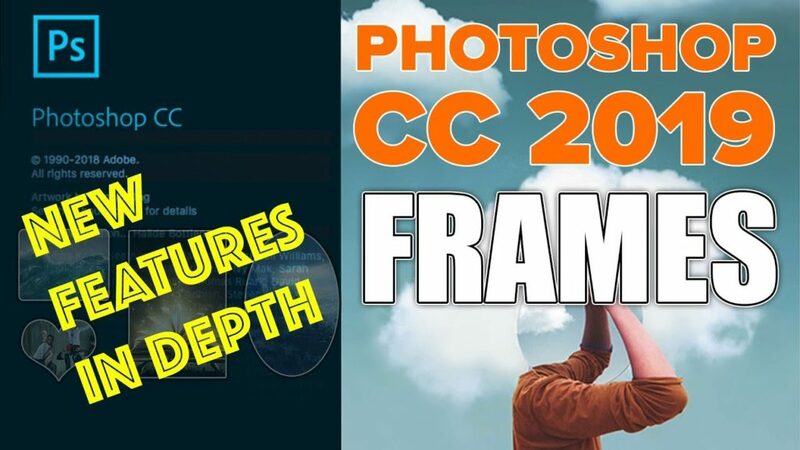 Also bear in mind,if you are a current Creative Suite owner, once you commit to the cloud, it might be a permemant decision, you could forefit your upgrade pricing should you decide to go back to the boxed product for CS7. Also decide if you need Business Catalyst, typekit and the 20 Gb cloud storage. (Cloud Storage and webfonts can be had for free from Google).Of course, the biggie will be how well Adobe integrates the cloud with the apps in useful ways for sharing and team workflows. We will report on that as features roll out. My advise is simple, look at your needs, do the math and make your decision accordingly. Don’t make your decision based on the $29.99 introductory offer, because you are in this for the long haul. 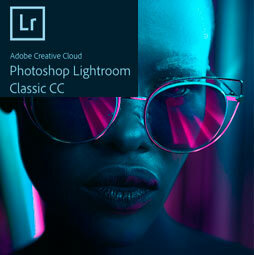 (update) Don’t forget about the new Photography plan for CC: The Creative Cloud Photography plan. 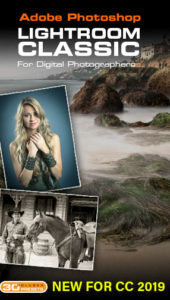 Only $9.99mo for Photoshop, Lightroom and Lightroom Mobile. All the CS6 information and more is available as a PDF magazine called the CS6 Superguide. If you’re on our list, you will receive it free by email as soon as it’s available. If not, sign up now and get the CS6 Superguide for free. its very basic information but it will help me.